Enjoy peace and serenity at SERENITY SHORES!! Whether you dream of a vacation full of sport and activity, or one of restful relaxation, a Serenity Shores retreat with family and friends is your passport to cherished vacation memories. Nestled in a peaceful bay on Cedar Island Lake, Serenity Shores provides guests all the comforts of home in a beautiful Minnesota lake setting, throughout ALL SEASONS of the year!. The spaciousness of this 1500 square foot two-level vacation paradise offers a million dollar view and room for everyone to enjoy. Each room in this upscale vacation home is tastefully decorated in an Up North decor. The upstairs features 2 queen bedrooms, a full bathroom, a fully furnished kitchen, and a spacious living room with windows overlooking the lake. Downstairs you will find a third queen bedroom, bathroom facilities, a kitchenette (including sink, mini refrigerator, and microwave), and a charming living room with barstools and a table offering a picturesque view of the lake. Just steps away from the walkout basement lies Cedar Island Lake, one of the 14 lakes on the Horseshoe Chain of Lakes. Connected by the Sauk River, the Horseshoe Chain of Lakes offer great diversity and 13 miles of water to explore!! Whether you are a fisherman, swimmer, skier, boater, or confirmed beach bum, you will find a staggering concentration of water to enjoy. NEW RENTAL OPTION AVAILABLE!!! PINE VALLEY, a SECOND vacation home rental, was added to our lodging inventory in 2010! Pine Valley features a beautiful Up North decor and is nestled in the same peaceful bay as Serenity Shores on Cedar Island Lake. Pine Valley is available for rent ALL SEASONS of the year and also offers two levels of deluxe accommodations with four bedrooms and two baths, all complete with a million dollar view! Call or email NOW for Serenity Shores and Pine Valley s best 2018 availability and rates! Both homes offer a fun and relaxing atmosphere everyone in the family will enjoy during all seasons of the year! My wife and I are humbled to be 4th generation owners/operators of Central Minnesota's premier vacation destination...Riverside Resort! Our property is located on Cedar Island Lake which is part of the historic Horseshoe Chain of Lakes. From our shore your family will have direct access to 15 different lakes spanning over 15 miles of water. We also offer a multiple activities throughout the week for both children and adults. You will not find owners who are more passionate about exceeding your vacation expectations than us! Adjacent to Riverside Resort which provides deluxe cabins and weekly activities for your family members of all ages! Breathtaking view, just steps away, of Cedar Island Lake on the Horseshoe Chain of Lakes. Walkout basement to your own PRIVATE beach! Garage parking available for all seasons! Complimentary HI - speed wireless internet. Full kitchen upstairs, kitchenette downstairs. Complimentary use of indoor swimming pool, whirlpool & sauna at Riverside Inn in Cold Spring, MN (7 miles). Walk out Basement steps away to the Lake, Kitchenette in Basement, Watercraft Rental, Swimming Beach and Playground amenities available through Riverside Resort. Endless family activities and memory making opportunities! Serenity Shores is located on Cedar Island Lake which is part of the historic Horseshoe Chain of Lakes. From our shore your family will have direct access to 15 different lakes spanning over 15 miles of water. This unique body of water offers endless fishing and recreational opportunities. 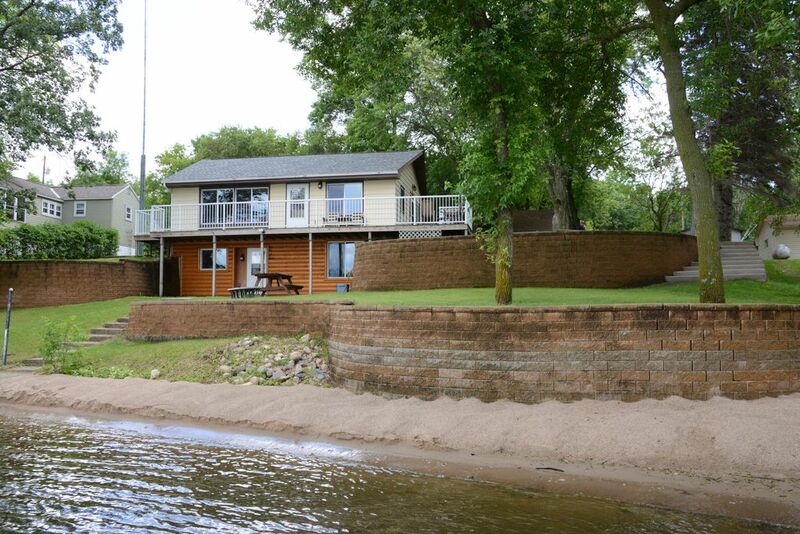 This Vacation home is adjacent to the popular Riverside Resort who's cabins have many of the comforts of home! They have a fully furnished kitchen, a combination air conditioner/heating unit, cable TV, and free wireless Internet just to name a few. Our family has been in the Memory Making business for 87 years and we would love for you to begin making treasured vacation memories with us! Riverside Resort offers multiple activities throughout the week for both children and adults. One unique perk we now offer is that resort guests are privileged to use the indoor swimming pool, whirlpool, and sauna facilities at Riverside Inn (hotel) in Cold Spring (7 miles from resort and accessible by either car or BOAT).